We took a day trip to Mammoth Lakes which is about 40 miles up the road from Bishop. The town is located at 8,000 feet (about 4000 feet up from Bishop) which caused some minor ear popping. However, Mammoth Lakes is also a lot cooler — about 20 degrees — than Bishop, and I didn’t account for that when I wore shorts. There was still snow on some roads. Anyway, it was stellar! Our drive followed the Sierras and several mountains in the range are still snow covered. About two-thirds of the way to Mammoth Lakes, the road (Highway 395) turns West, gains more elevation, and if you look South, you can see the long valley between the ranges. We took Highway 203 into Mammoth Lakes and stopped at the visitor’s center. We left with good info and maps. We’ve seen lakes before, but not in a mountainous environment. Beautiful. 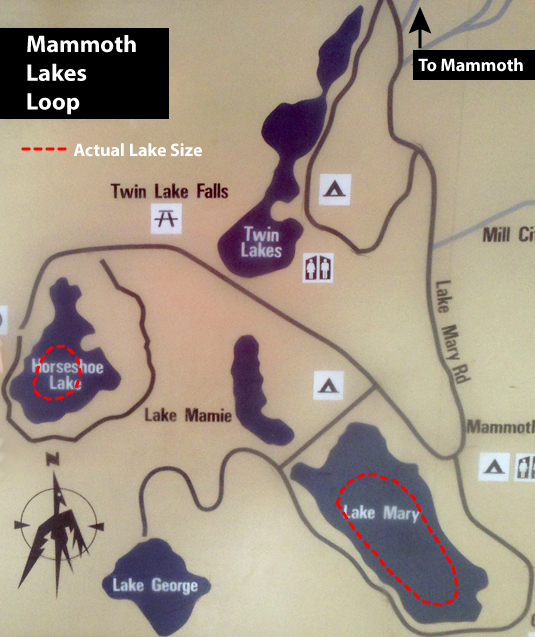 Horseshoe Lake and Lake Mary were the only two lakes we saw up close and both lakes were low (see the map above). Horseshoe Lake was the most interesting — it’s a Carbon Dioxide Hazard Area . . . see the photos below . . .
Soo.. Bishop was 76 and at Mammoth it was 56? What a surprise to the system.. Brrrr..
We’d probably fall out of our pants here if it was 76. The nice warm weather is avoiding us. Grrr. Looks like you two are having some great times discovering and adventuring.. Way Cool ! !